DESCRIPTION: Situated in a much sought after village location is this truly stunning 4 bedroom detached cottage which stands in established gardens and land extending to 2.8 acres. The property occupies an elevated position with picturesque views over the surrounding countryside and the market town of Mold. The property has been improved by the present owners to a high standard and offers generous sized versatile living accommodation which briefly comprises:- entrance hall, fitted farmhouse style kitchen with integrated appliances,dining room, inner hall, cloakroom/utility room, study/sitting room, dining room, lounge, conservatory, and to the first floor there is the master bedroom with ensuite and having a balcony that takes full advantage of the views, 2nd bedroom with ensuite, 2 further bedrooms and a family bathroom. The accommodation is complimented by oil fired radiator heating, double glazing and externally there are established gardens which are approached through electric gates and provide ample off road parking, stone built stable block/workshop and a paddock to the front and side elevation. As selling agents we feel a viewing is a must to fully appreciate the wealth of features the property offers and the stunning location. DIRECTIONS: From the agents Mold office turn right and proceed down to the mini roundabout and take a left turn and proceed to the main Mold roundabout take the 3rd exit onto the Denbigh Road and proceed to the next mini roundabout and turn left for Gwernaffield, continue for approximately 1.9 miles and at the crossroads in the centre village turn right passing The Hand Public House,continue for 0.2 miles and turn right onto a track (TY DRAW ON CORNER) continue keeping to the right and a set of electric gates will be noted which gives access to the property. 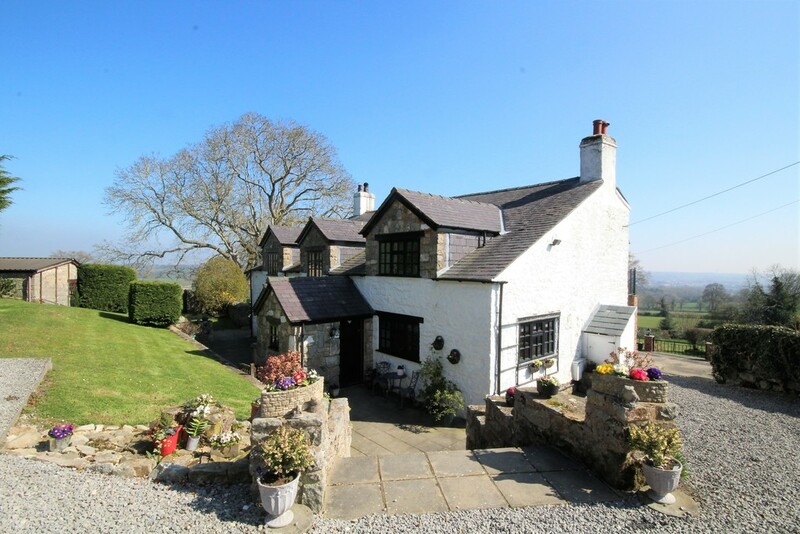 LOCATION: Situated in a popular and sought after village location with easy access to local amenities in the neighbouring village of Pantymwyn to include a convenience store and post office and for a wider range of services there is easy access to Mold town centre facilities and the main road network for commuting to Chester city centre and the surrounding areas of employment. HEATING: Oil fired radiator heating installed December 2018. ENTRANCE PORCH Tiled floor. Fitted storage cupboards. Stable style rear entrance door. KITCHEN: 17' 3" x 11' 1" (5.26m x 3.38m) Panelled radiator.The kitchen is fitted with a comprehensive range of farm house style wall and base units with granite worktop surfaces which incorporates a breakfast bar, inset bowl and drainer with granite splash back with integrated appliances to include hob, extractor hood, double oven, microwave fridge and dish washer. Inset ceiling lighting. Tiled floor. Stable style door leading to entrance porch. Open plan to dining room. INNER HALL: 2 Panelled radiator. Stairs to first floor. Understairs storage cupboard. Door leading to conservatory. CLOAKROOM/UTILITY ROOM: Panelled radiator. Tiled floor. Fitted worktop surfaces with wall cupboards above. Plumbing for automatic washing machine. Fitted two piece suite comprising low level wc and wash hand basin. SITTING ROOM/STUDY: 13' 8" x 11' 1" (4.17m x 3.38m) 2 Panelled radiators. Window to front and side elevation. LOUNGE: 15' 1" x 15' (4.6m x 4.57m) Panelled radiator. TV point. Feature stone open fireplace. Two picture windows to side elevation. Double doors leading to conservatory. CONSERVATORY: 23' 2" x 12' 5" (7.06m x 3.78m) Tiled floor. Two wall mounted electric panel heaters. French doors leading to rear garden. STAIRS AND LANDING: Panelled radiator. Velux sky light. BEDROOM 1: 15' 2" x 15' (4.62m x 4.57m) Panelled radiator. TV point. French doors leading to balcony offering picturesque views over the surrounding countryside and the market town of Mold. ENSUITE: Panelled radiator. Heated towel rail. Inset ceiling lighting. Fitted with a three piece suite comprising wc, wash hand basin, and large tiled shower chamber with fitted shower. Inset ceiling lighting. BEDROOM 2: 15' 7" x 9' 9" (4.75m x 2.97m) Panelled radiator. Telephone point. Window to rear elevation with picturesque views. DRESSING ROOM: 5' 8" x 5' 6" (1.73m x 1.68m) Hanging rail with shelving above. Door leading to ensuite. ENSUITE: Chrome style ladder towel rail.. Fitted with a three piece suite comprising low level w.c., wash hand basin and shower chamber with fitted shower. Tiled walls. Tiled walls. Inset ceiling lighting. BEDROOM 3: 13' 8" x 11' 3" (4.17m x 3.43m) Panelled radiator. Built in airing cupboard and wardrobe facilities. loft access. Feature beams to ceiling. Window to front elevation. BEDROOM 4: 13' 8" x 11' 2" (4.17m x 3.4m) Panelled radiator. Tv point. Fitted sink. Window to front and side elevation. BATHROOM: 8' 9" x 7' 8" (2.67m x 2.34m) Panelled radiator. Fitted with a three piece white suite comprising wc, wash hand basin and freestanding bath with mixer taps and shower attachment. OUTSIDE: The property is approached by wrought iron electric operated gates which leads to a gravelled driveway which offers ample off road parking. To the front of the property there are lawned gardens and a farm style entrance gate leading to the paddock which sweeps round to the rear of the property. There is a further gated access leading to an enclosed lawned area with stone outbuilding which comprise a workshop with two adjacent stables/loose boxes. To the left hand side of the property there are steps leading to the rear and further lawned gardens, to the right hand side there are further steps leading to the rear and there is a coal bunker and outside boiler house housing the Worcester oil fired boiler. To the rear there is a large paved patio area taking full advantage of the spectacular views and there are steps leading down to further lawned gardens and an additional access to the paddock..